Otterlo 19 km from Arnhem: Child friendly holiday development "Droompark de Zanding", surrounded by trees. Outside the resort, 1.5 km from the centre of Otterlo, in a quiet position, along the wooded area. For shared use: property, lawn for sunbathing, pond, indoor pool. Tennis (extra), volleyball, children's playground. In the house: reception, restaurant, WiFi, sauna, steam room, infrared sauna, relaxation room, laundry, bicycle rental. Bread roll service. Parking at the house. Central parking spaces. Natural swimming pond 200 m. Nearby attractions: Nationaal Park de Hoge Veluwe 1 km, Kroller Muller Museum (fiets) 3 km, De Apenheul 22 km, Paleis 't Loo- Apeldoorn 24 km, Burgers Zoo- Arnhem 16 km. Please note: the photograph shows a typical example. There are more similar properties for rent in this same residence. All houses/apartments are individually designed/furnished. If the reception thinks it is necessary to ask a caution, you will have to pay this upon arrival for example for groups or longstays the reception asks a caution of € 400-€ 600 per house. For a preference about the location of the bungalow, € 12,50,- preference costs will be charged to be paid on the spot. Longstays (longer than 21 nights) on request! Please note: workmen not allowed. Child bed in total count of number of people. "Type C", 3-room chalet. Stylish furnishings: open living/dining room with dining table and TV. Exit to the terrace. 2 rooms, each room with 2 beds. 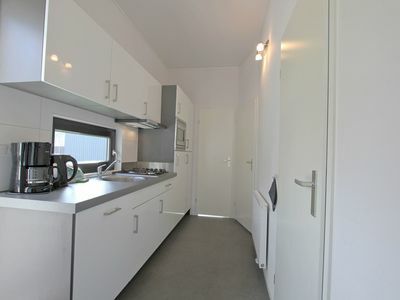 Open kitchen (4 hot plates, dishwasher, electric coffee machine, combination microwave). Shower/WC. Terrace furniture. Facilities: Internet (WiFi, extra). Reserved parking at the house. Pets on request.